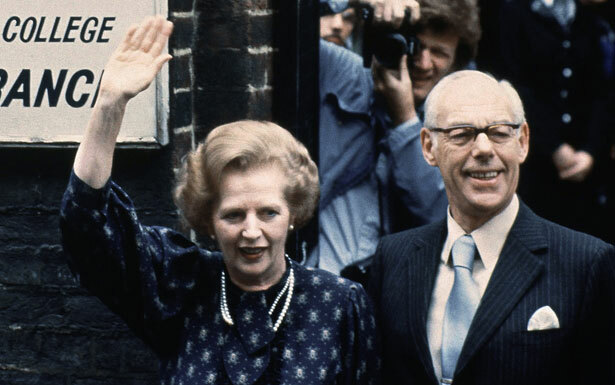 Margaret Thatcher's smiling villainy sparked a generation of dissent—and neoliberal policies that live on today. Margaret Thatcher’s dead at last, and the pictures that crowd in speak of war and confrontation: riot police on horseback bringing their batons down on the heads of striking miners; cars in flames in Trafalgar Square during the poll tax riots; riots in Brixton and Toxteth against racist policing; US cruise missiles nestled behind the fence at Greenham Common; the infamous Sun headline—GOTCHA—when the Argentine cruiser Belgrano was sunk outside the Falklands exclusion zone; the ten IRA hunger strikers for political status dead in the Maze prison; the IRA bomb that almost killed Thatcher herself in Brighton. Hard on their heels come images of polished domestic smoothness: the handkerchief disapprovingly dropped on the tail of a model plane that bore no Union flag; the helmet of bright hair; the handbag, sign of female thrift and household management, of the grocer’s shop at Grantham gone terrifyingly global. The slide shows are two sides of the same coin: it’s partly because Margaret Thatcher was a woman that she was able to drive through her relentless war on the unions, the working class, the welfare state, the left. Her eleven years as prime minister tore Britain apart, dead-ended lives, decimated industries and starved communities, made greed a virtue and indifference a mark of maturity. Her ruthlessness came coated in a lethal emollient: the soothing voice, the honeyed firmness of the nursery. She was the first British leader built for television, a masculine fantasy of forceful femininity. We are all Thatcher’s children now, in Britain and in Europe, where the austerity policies she road-tested in the eighties are being applied as if there were no alternative and no tomorrow; Germany’s Angela Merkel is the lady not for turning now. In the week of Thatcher’s death, Britain has seen deep welfare cuts—deeper than hers—with tax cuts for top earners. The language of “skivers versus strivers” in which the Tory party has framed this debate would have been political poison before the 1980s, when Thatcher and Ronald Reagan whipped up resentment of “welfare moms” and welfare dependency. New Labour, Thatcher’s greatest success, firmly hammered home her counter-revolution, chiselling at the principle of universal provision in health and education, reducing class mobility, cutting child poverty but widening the gap between the lowest and the highest earners. Privatization, discipline, austerity in a recession, kill-or-cure remedies: in so many ways, Thatcherism is now the new normal. In the months before her death, “Lady Thatcher” enjoyed a rehabilitation. There was the Meryl Streep film Iron Lady, which framed her political career with a touching portrayal of her descent into dementia; there were the Cabinet papers from the time of the Falklands war, released a few weeks ago, which described her breaking down in tears at the thought of sending British boys to their deaths. Obviously to hate Thatcher (as so many of us do) is to succumb to a reverse cult of personality. But it isn’t only that. Like her friend Ronald Reagan (who can forget the Campaign for Nuclear Disarmament’s poster of the two of them as Rhett Butler and Scarlett O’Hara before a mushroom cloud?) she was one of those politicians who sums up and seems to embody more than a set of policies: a shift of mood, a zeitgeist, a way of thinking and feeling about social life. Her megalomania knew no bounds. (With Reagan she took credit for the fall of the Soviet Union, as if it were a consequence of her crusade against the left.) She shifted the boundaries, rolled back decades of progress, moved British politics irrevocably to the right; now that she’s dead, we have to endure the spectacle of a “ceremonial funeral with military honours” in St. Paul’s Cathedral, as if she were some sort of saviour of the nation. The dead hand of tradition will heap blessings upon her head, along with no small number of her old enemies. The millions of us who dissent will remember that hypocrisy is essential to the British elite; that one may smile, and smile, and be a villain. Read Allison Kilkenny's take on the Tory's new tool of regression: the "bedroom tax."